We have just finished extensive re-modeling, including new 18x18 Italian floor tile throughout, new kitchen and bath cabinets with granite countertops, and brand new teak plantation style furniture. Our home away from home is located on the third floor, and has expansive ocean views from the bedroom and living room lanais. Our unit also faces the beautiful INTERIOR of the complex and/or overlooks the well manicured tropical landscaping and pool area (versus many other units overlooking the exterior and/or the mountain view/parking lot area). 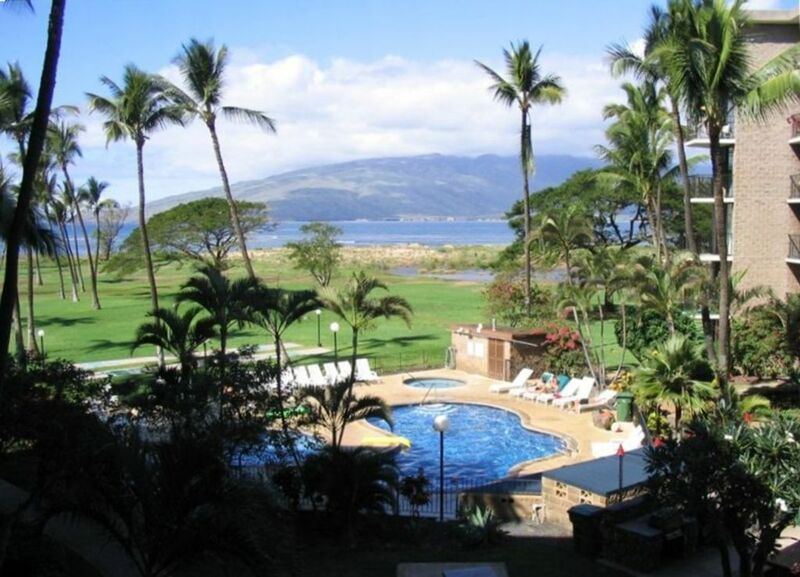 Our condo is located in the Kauhale Makai Resort, and is also known as Village by the Sea. Our address is 938 South Kihei Road, #328, Kihei, Maui, Hawaii, and we are on the ocean side of Kihei Road. Our unit comfortably sleeps four with a brand new serta king size bed with luxurious 600 thread count sheets, and queen size futon in the living room. Our condo complex features a manned lobby, concierge service for booking your outings, elevators, coin operated laundry rooms on every floor, newly remodeled pool area plus a kiddie pool and Jacuzzi, gas fireplaces adjacent to the pool, a putting green, a volley ball court, and shuffleboard. We also have the most incredible ocean side tennis courts immediately adjacent to our complex. And we have broadband high speed internet (the fastest speed on the island). We are a 20 minute drive from Maui – Kahului Airport. We are 2 minutes from downtown Kihei with grocery stores, restaurants, and shopping aplenty. We are within 5 minutes of the world famous Kamaole I, II, and III beaches. And we are within 10 minutes of beautiful Wailea and the upscale 'Shops at Wailea' shopping center. Maui is world famous for its beaches, and you will find that you can trek from the beach in front of our unit endlessly along the coastline. We take pride in our home away from home and hope you enjoy it as much as we do. We have owned this unit since 1983 and have remodeled our unit 3 times constantly bringing it up to meet the needs of our clients. We have been very involved in the property and on our six week stays, we make sure that everything meets our standards. We have been with VRBO since 1999, one of the beginning members. It is truly our home away from home. We bought this property in 1983 because of its beautiful surroundings, great location on the water, close proximity to shopping, elevator, in unit air conditioning and beautiful view of the ocean. At night, the lights of Maalaea Harbor are lit up, and you can see the far away lights of cars coming and going to Lahaina. Whales are constantly seen from the lanai during whale season. Free whale watching from our lanai. A view of what is happening at the pool and BBQ area. Watching the sail boats stop in front of our complex to let their paying guests swim with the turtles. Watching sail boarders in the afternoon zipping to and fro from our lanai. Wading in and walking through hand made areas where fish reach maturity along our beaches. Letting go of life's complications and just relaxing and enjoying the birds and ocean views. Staying connected with love one's through our high speed wifi. Controlled in unit. We also have 2 ceiling fans in dining area and bedroom. Public tennis courts for all to use on complex to our left. Easy access from elevator to unit door. Access to sauna, ask at office.